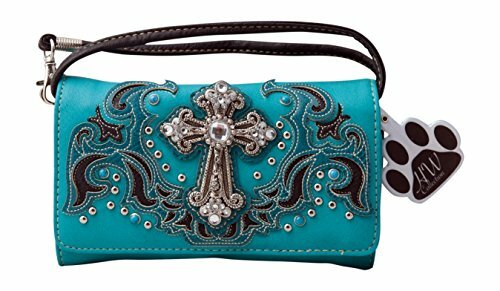 Western crossbody style wallet/wristlet/clutch is made from high quality premium faux/imitation leather with cut out colored scrolls, blue beads, silvertone studs, large rhinestone silvertone cross, and detachable HW Collection key ring on the front. Single, removable strap to convert the wallet into a wristlet and a single, long removable shoulder/crossbody strap. Snap closure. Flat currency compartments, expanding accordion area for coupons or receipts and a zippered pocket on the inside for coins. 9 slots on the inside for credit cards, ID, or business cards and 3 clear ID windows. Zippered and slide pocket on the back along with HW Collection logo. 7.5 inches long X 1.5 inches wide X 4.5 inches tall. Aside from use as a wallet, it is great for occasions when you don't want to carry a big handbag and just want to bring the essentials so by using one of the straps you can be hands free! If you have any questions about this product by HW Collection, contact us by completing and submitting the form below. If you are looking for a specif part number, please include it with your message.